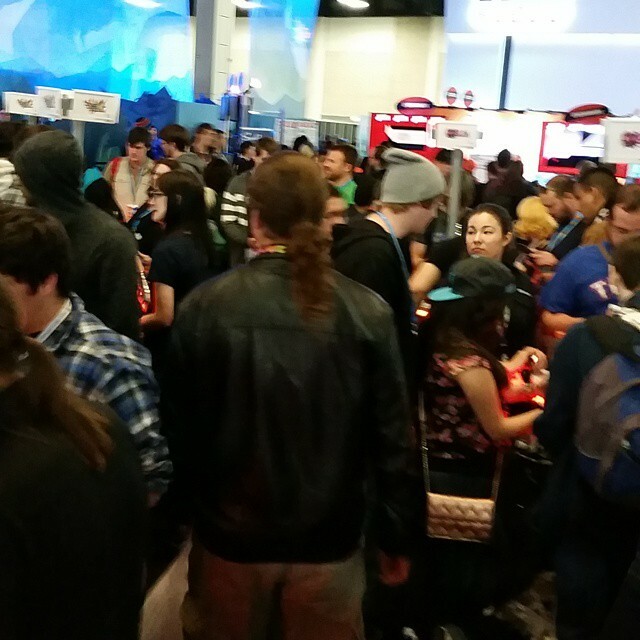 The crowd at the Nintendo booth! This weekend (Jan 23-25) the folks at Penny Arcade put on their latest in shows, PAX South at the Henry B. Gonzales Convention Center. This is their first year down in San Antonio. Being that PAX has been around for over a decade, I was anxious to see just WHAT PAX was all about. 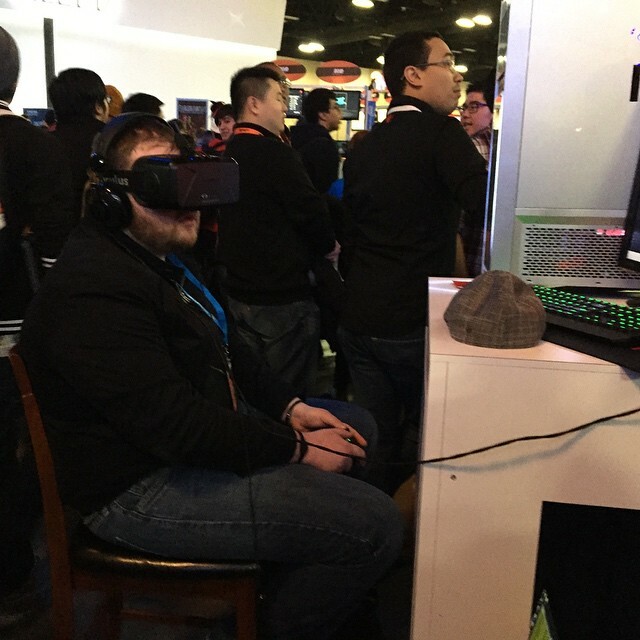 I traveled to the River City to experience all that was PAX South first hand. First and foremost, this is a gaming and tech convention! Exhibitors from big names such as Nintendo, Intel, Alienware,Logitech, and many others were there. There were also a lot of independent developers there as well handing out game codes to try out their software. I’m actually looking forward to checking them out on Steam. Tabletop gaming was also rampant! Steve Jackson Games (Along with Steve Jackson – who was ready to play you in Munchkin! ), Magic The Gathering, and many others were represented at the show! As a side note, O got to try out the Oculus Rift over at the Intel booth and she says it’s pretty much the most amazing thing ever. Playable demos was the bread and butter of the exhibitors. You could check out the new 3DS XL and play Smash Bros or LoZ: Majora’s Mask over at Nintendo. You could check out Elite: Dangerous over at their booth, you could demo EVE: Valkyrie, Dungeon Defenders II, and many many others! If you heard of a game that you weren’t sure you wanted to buy before playing, this was your chance! There was also several open/free gaming rooms! There was the console room where you could check out one of the latest gen systems and play with a group, there was the retro gaming arcade that included cabinets such as Mortal Kombat II, 3 ultimate, Street Fighter II and III, DDR, Killer Instinct 1 & 2, and even pinball machines! Programming included panels from game developers over the weekend. Riot games held a panel, giving the latest updates in their hugely popular MMO League of Legends. Bioware had their Bioware Base set up and held panels with developers from Dragon Age. (Still mum’s the word on Mass Effect 4). 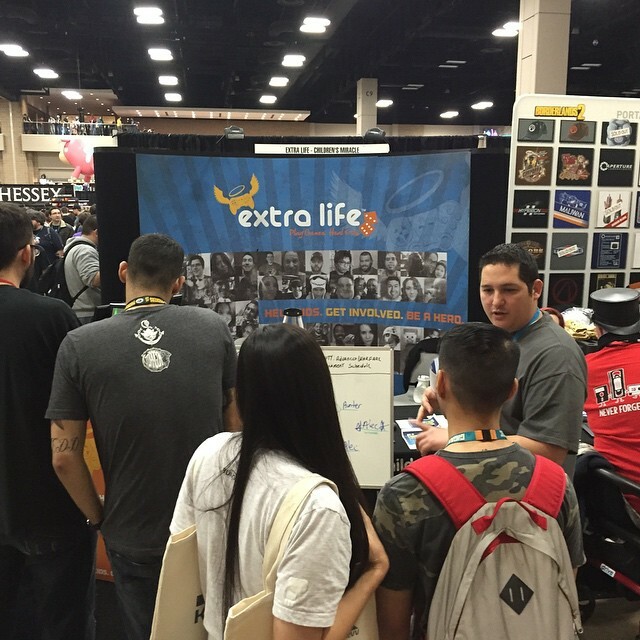 Extra Life! The charity I’ll be gaming for this year! There were also quite a few vendors, such as We Love Fine and Glitch. MTG had a booth where they sold decks and expansions, and Steve Jackson Games was busy selling their wares as well. There was something there for everyone! Overall, we had an absolute blast and look forward to next year’s show! It was crowded, but still manageable – it looks like they’ll be able to expand into the whole convention center next year (and need to!). 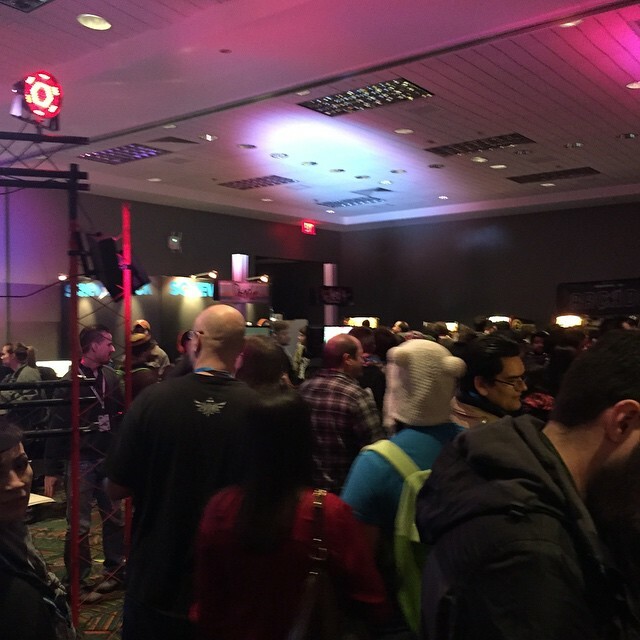 PAX South will return to San Antonio throughout 2017. Keep an eye out on the PAX South website for ticket information, as this year 3-day passes sold out in a matter of days and Saturday tickets sold out soon after.